The call of the Pied-billed Grebe is unusual. Their nests are unusual too – little platforms of plant material that float on water, hidden behind vegetation. Martin Muller, an expert who loves unraveling the mysteries of Pied-billed Grebes, explains how grebe parents like this one build their nests. The call of this water bird, the Pied-billed Grebe, is unusual isn’t it! Their nests are unusual too – little platforms of plant material that float on water, hidden behind vegetation. The birds are diving for decaying plant material, picking it up from the bottom of the lake, piling it up until it forms a floating mass. 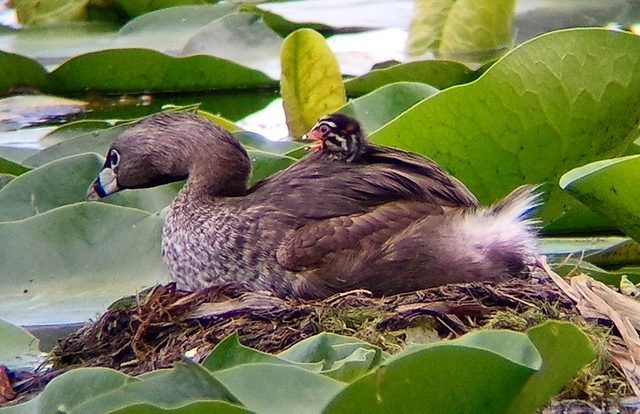 You can learn more and see photos of a nest and of newly hatched Pied-billed Grebes, at birdnote.org. Bird sounds provided by The Macaulay Library of Natural Sounds at the Cornell Lab of Ornithology, Ithaca, New York. Call of Pied-billed Grebe  recorded by G.A. Keller.